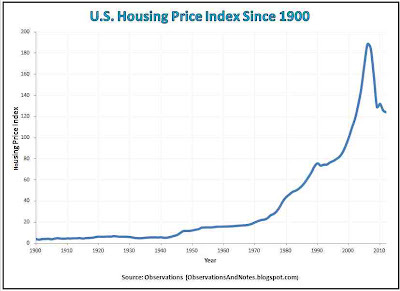 This post illustrates the increase in U.S. housing prices since 1900. However, considering price alone is a misleading way to evaluate the performance of residential real estate. Investors who fail to do additional analysis are likely to overestimate the attractiveness of housing as an investment. imperfect. However, it's the best source of long-term housing data that I am aware of. Note that he has attempted to adjust for the significant increase in the size and quality of homes over the past 100 years. In effect, he has attempted to estimate the price of houses of constant size and quality; otherwise, we'd be comparing apples and oranges. In addition, note that this is an index, not actual prices. 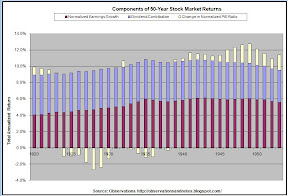 The index values are relative to the year 2000, which has been assigned an index value of 100. Using the index values, we can convert a price from any year to any other year. For example, we can calculate that a house that cost $100,000 in 2000 would have cost a little over $10,000 in 1950, and approximately $125,000 in 2012. The graph is, I think, representative of how many people think about investments in real estate. That is, their view is shaped primarily by the change in the price of specific properties -- often over several decades. For example, in 2005, you'd hear stories like "my parents paid $50,000 for this house in 1975, and now it's worth $300,000." However, A $50,000 Home Sold for $300,000 Does Not Produce a $250,000 Profit! If a $50,000 home sells for $300,000 30 years later, many people see this as a $250,000 profit. However, a little thought should convince you that this is not the case. To do a thorough analysis, you would need to consider the total impact that the purchase of the home had on the buyer's finances. That is, we need to look at all of the net additional expenditures associated with the purchase. Otherwise, we will be misled. Here is a sample of some of the most significant additional expenditures -- i.e., beyond "purchase price" -- that need to be factored into a more thorough analysis of residential real estate investments. Miscellaneous purchasing costs: In addition to the sales price, the initial cost typically includes application fees, appraisals, inspections, legal fees, and possibly other closing costs. In my experience, this adds thousands of dollars to the initial outlay. Taxes and insurance: Real estate taxes can be thousands of dollars each year. (Note: these are also currently tax deductible.) In addition, mortgage holders require that homes be insured. Maintenance & improvements: These costs never seem to end. From repairing/replacing air conditioners, furnaces, appliances and the roof, to interior & external painting, to .... In addition, longer-term owners typically spend significant amounts on "improvements." These can range from a minor bathroom update to adding a new bedroom or patio, to completely redoing a bath or kitchen. A major improvement can cost as much as a small house! These costs are all part of the cost of owning a home. Selling costs: Finally, to get that "profit," you have to sell the property. Traditionally, 6% of the sales prices goes to the broker, plus there are additional closing costs such as the title search. In addition, there are often fix-up costs to prepare the home for sale, and "staging" costs to make your home look as attractive as possible to potential buyers while it is on the market. Other costs: Additional costs may or may not be appropriate to include depending upon the circumstances. For example, in some cases the net proceeds of the sale are subject to income taxes. As you can see, the purchase price is just the beginning of the total cost of the home. However, too often, many or all of the additional costs listed above are left out of the home investor's mental calculations. You might be more interested to know that the average annual home price increase for the U.S. during the whole 1900 - 2012 period was only 3.1%/year -- just a shade better than the inflation rate of 3.0%/year. Evaluating a home purchase is not as simple as subtracting the purchase price from the sales price. Doing the evaluation that way overlooks the factors I've listed above -- all of which tend to make the purchase less attractive. To be fair, there are additional factors that tend to make the purchase more attractive -- especially the facts that a) the purchase price is not all paid at the time of purchase, but in installments, and b) the costs are normally partially offset by the elimination of some other costs (e.g., rent). We'll look at the impact of some of these factors in more detail in future posts. 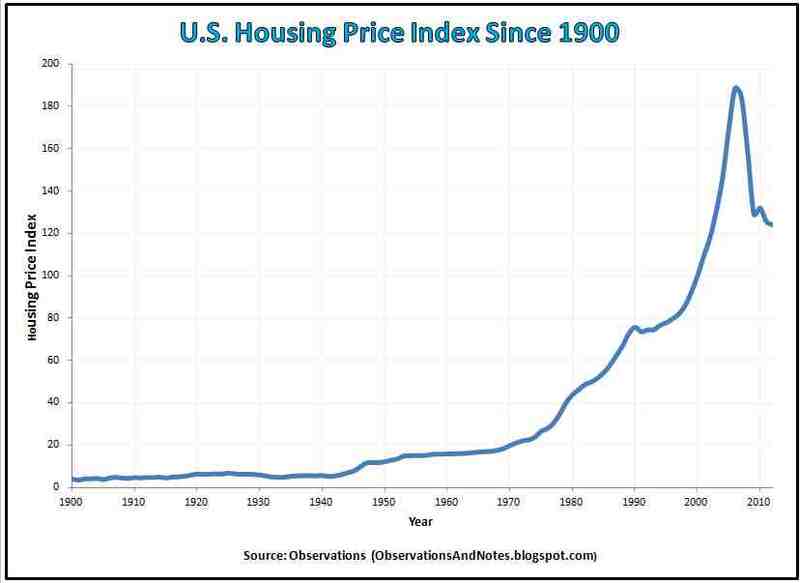 100 Years of Inflation-Adjusted Housing Price History: similar to this post, but adjusted for inflation. Planning to Buy a House Spreadsheet: Downloadable Excel spreadsheet to help you plan for these housing expenses. The Risks & Disadvantages of Low & No Down Payment Mortgages: Why you should be wary of 0%-5%, and even 10% down mortgages. Planning to Buy a House discusses additional strategies for becoming a successful homeowner. Can I Afford this House? (Benchmark): a helpful benchmark to compare yourself against. 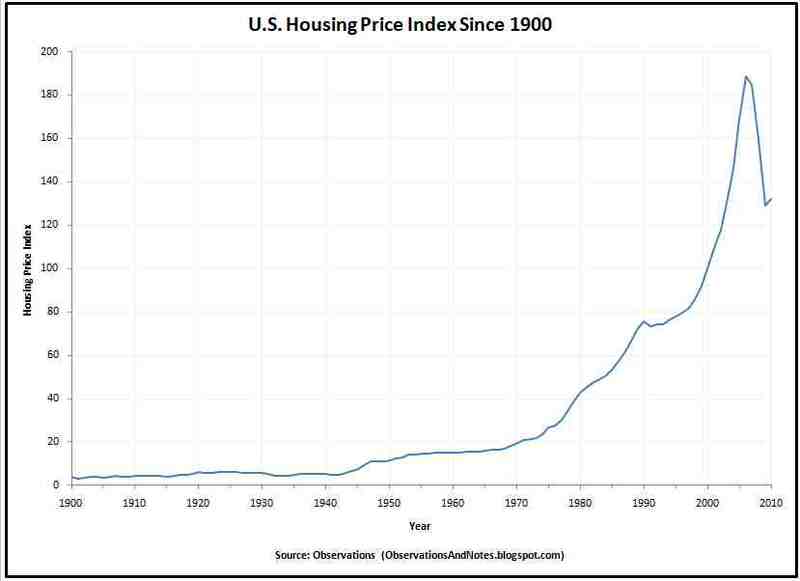 Robert Shiller "Irrational Exuberance" Housing Data: Shiller's housing price index data beginning in 1890. For lists of other popular posts and an index of posts by subject area see the sidebar to the left or the blog header at the top of the page. Although this is a great post, even history as far back as 100 years for housing or the stock market or bonds as misleading as america dominated through the industrial revolution in that time frame and shifted off the gold standard twice during that time. Also, guess which country went from 20% of the world's wealth to 40% in that timeframe? Our school systems are designed to thrive in the industrial revolution producing lots of factory workers and employees which is perfect for mass production. The problem is in the future in the information age robots, computers and machines are replacing the employer. The EMPLOYEE SURPLUS is a problem, and the EMPLOYER deficit is the problem. Going forward how many more residential houses are they going to make? How many people are going to move to this country? A school system or alternative school system that was taught by businessmen and inventors who received a tax break for their business for teaching for example and also received 5% stake in any business that was started by those students, would go a long way towards producing an environment where employers can be created. If this doesn't happen, america will most likely decline as many predict due to increased restlessness of the growing unemployed, political upheaval perhaps, and too many houses that too few people can afford as a result of the high unemployment.